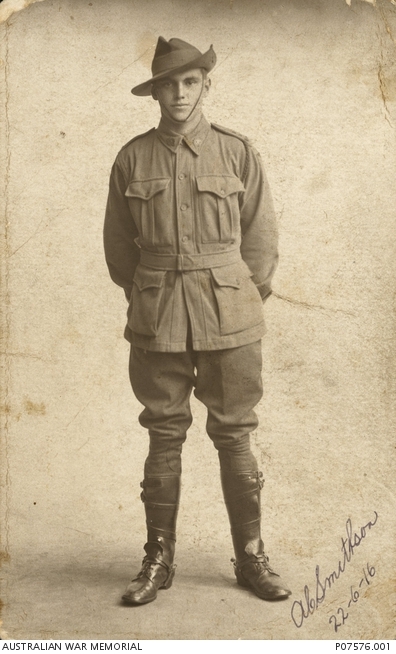 Studio portrait of 12 Driver (Dvr) Albert Charles Smithson, 1st Field Artillery Brigade, of Annandale, NSW. A carpenter before enlisting in August 1914, Dvr Smithson left Australia for Egypt in October 1914 where he was a horseholder until arriving in France for service on the Western Front in March 1916. After leave in England in May 1916, Dvr Smithson was promoted to Bombardier in August 1916, and later Corporal (Cpl) in October 1916. Cpl Smithson was wounded in the back from German counter-battery artillery fire near Albert on 1 November 1916. He was evacuated to the 38th Casualty Clearance Station at Heilly where he died the following day, aged 21.